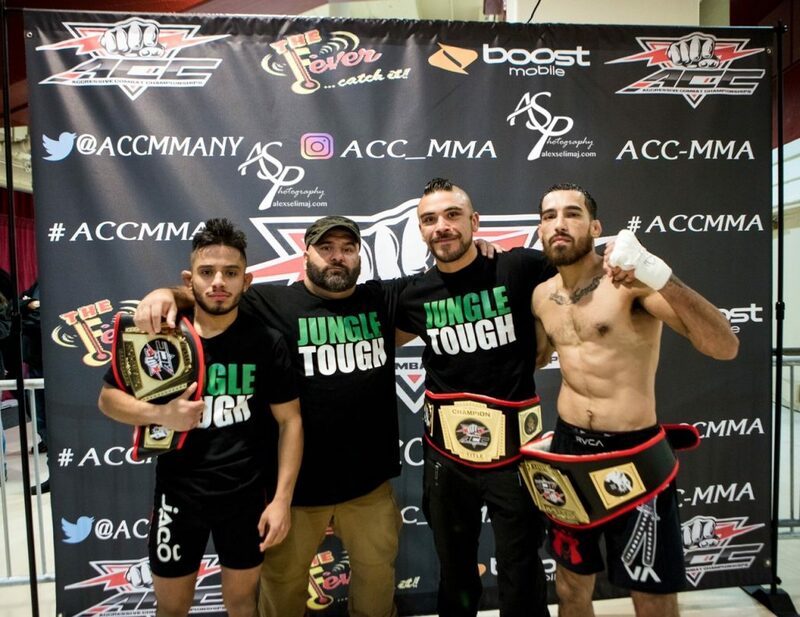 This past Saturday the Jungle Gym sent 3 warriors into the cage for 3 title fights. In the end all three men came out victorious. First up, at 185 lbs was Victor Landeta. Landeta quickly dispatched his opponent by walking through his strikes to secure the takedown. Once on the ground, his opponent had no answer, and was submitted easily. Next up, at 125lbs was Edwin “Chi Chi” Solis. Chi Chi was able to shoot off combinations that forced his opponent to adopt a wrestling strategy. Chi Chi’s wrestling defense proved to be too much, and his opponent ended up on the wrong end of some clean combos. This earned Chi Chi a dominating 30-26 decision victory. Finally, at 135lbs was Daniel “Flaco” Rodriguez. Most of this fight was on the feet with Flaco hunting for the KO. The first round was pretty close and could have gone either way. The second round was dominated by Flaco who landed some clean shots and a big slam. In the final round Flaco was clipped flush with a spinning back fist that had him on auto pilot. Eventually, the fight ended up in Flaco’s guard where years of bjj training came to his aid to get the arm bar victory with just one second left in the main event. One of the most epic moments in Jungle Gym’s history. We are just one week away from NAGA! We have a students looking to compete, and for some it’ll be their first tournament outside of the Jungle Gym. Now it is completely normal for your kids to feel nervous and scared when competing for the first time. The big thing we want to express to them is that winning or losing doesn’t matter (for now), what we want to see is effort. As cliche as it sounds, all we can ask for is that a kid tries their best. At this age the kids are just building experience, 10 years from no one is going to remember who the kids division NAGA champion was. If you guys have any question about the tournament feel free to ask any of the coaches. Promotions are coming up very soon guys! We are about a month away from the Jungle Gyms next promotions ceremony. Pretty soon those tat are eligible will be receiving promotion list, with a set of moves that they will have to show to a coach to get their next belt. Make sure you guys are not only getting these techniques down pack, but that you are also remembering the names. “Ohhh, I know that move I just didn’t know the name.” We’ve heard that phrase many times over the years. Not only is remembering the names to your techniques important for completing your list, it’s also important in live situations like a tournament where a coach will be screaming techniques at you. If you don’t know what the coach means by “Upa”, then your gonna have a hard time. If you have any questions on promotions, your coaches will help you out. Also Jungle Tough shirts are in, those of you that pre ordered come pick yours up today. A summer body in winter? Yes please! It’s that time of year where the weather is getting cold and all you want to do is wrap up in some blankets,drink some hot coco and watch the newest episode of The Walking Dead (don’t worry no spoilers here). But if you’re still looking to lose weight, get in shape, or just get healthier then you know there is no off-season for your goals. So put those blankets away, put the hot coco on the back burner, TiVo that show for later, and get down to the gym where the coaches are waiting to teach you and your teammates are waiting to train with you. The fact you’ll stay warm and work up a sweat is a bonus too. As always I will see each and every one of you in the gym. Let’s make it happen. The 3 champs of the weekend. All three worked hard and are great representations of what the Jungle Gym is about!